Sorry for not keeping up with posts how I wanted to – we don’t have internet at our new place until the 4th, so even though I have outfits ready to post (as you can probably guess, seeing as I’m still posting pictures from Australia, even though I’ve shot outfits since I’ve been back too!). I’ve been trying to use my mobile internet for as much as possible, but that’s now ended me up in the position of being 6 days into this month’s plan having used nearly all of this month’s data. As I’m writing this it sounds like the ultimate first world problem, but I just wanted to apologise to you guys for not posting new content for you anywhere near as much as I wanted to! 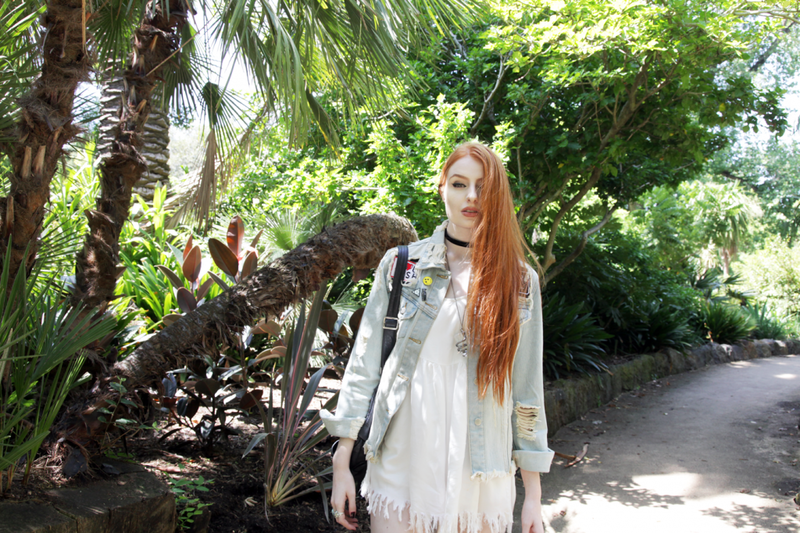 This was my outfit for one of the warmest days we were in Melbourne. It was the first day where had to forgo my usual mainly black wardrobe in favourite of more light tones! I love how well these two UNIF pieces go together – that’s what I really like about their pieces, even if they’re from different collections the pieces match (or mish-match) up beautifully. I topped the outfit off with my chunky velvet docs as I didn’t bring any lighter footwear and they’re super comfy for stomping roound the city and its gardens. Brighter than your usual look, cool! Such a grungy look. Makes me think of 90's punk rock girls. White color fits your pale skin! Wow just wow! everything about this is amazing! The denim jacket is such a nice piece with those badges to add a different take, I honestly wish I had your hair so badly it is such a beautiful tone! In love with your backpack! I love the jacket! Perfect style as always! your legs are sooo long, wow""
I love the way you're wearing light colors. Always spectacular and alternative – awesome!